Back to cards again for today’s show and tell. 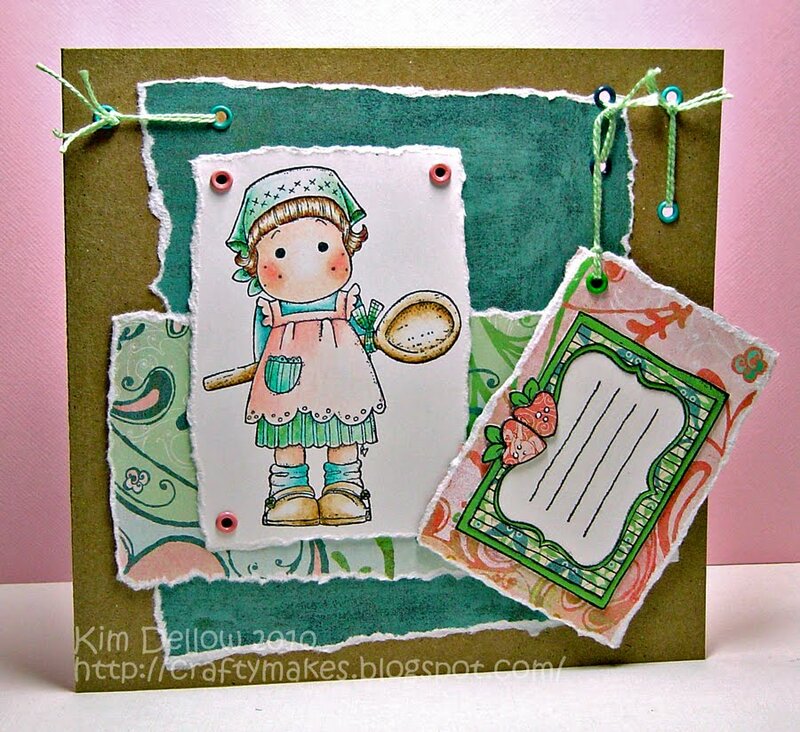 This card uses the lovely sketch and hidden message inspiration from this week’s Truly Scrumptious challenge. Looking back over this week’s postings I have managed to post for a challenge everyday which I think is a first for me! Ok so one of those posts was a challenge DT make but still not bad going I thought! Well, hope your day is full of fun. So the weekend begins. Ahh lovely weekend. 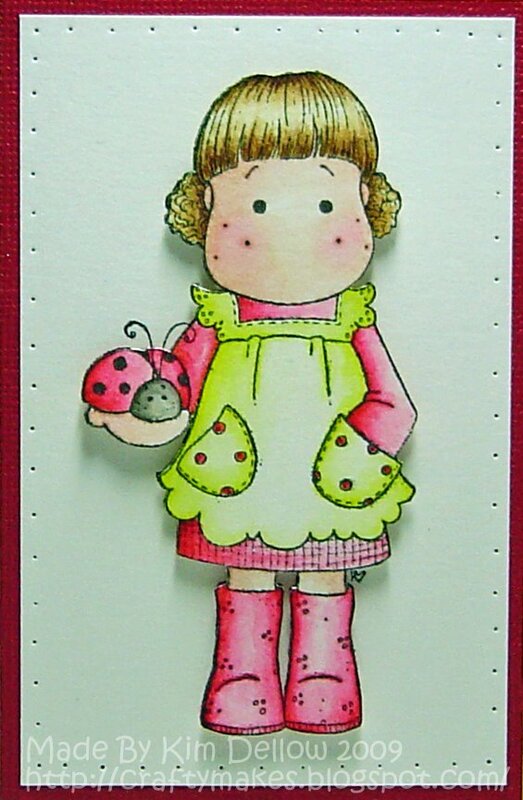 Tilda is here to celebrate the weekend with a Simon Says Paper piecing challenge. I’ve made a circle card for one main reason, I had run out of this lovely dark brown cardstock and the only piece I had left was this tiny bit! Bless! So with a little frugal jiggery pockery I managed to make it run to a couple of matts. But why didn’t I use another colour? Well I had already pieced the Tilda in these yummy Basic Grey papers before I realised I had no cardstock to match – D’oh! 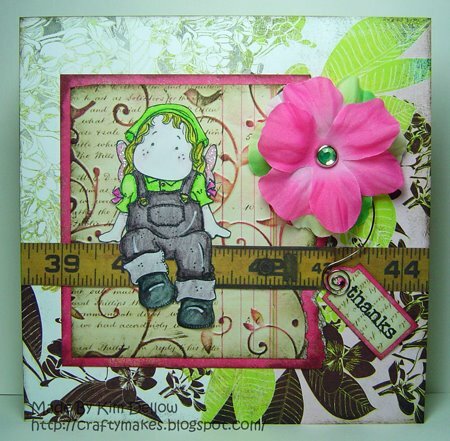 Morning folks, here is a Summer card for you this morning using the super-cute Magnolia stamp and some HOTP papers. Hope you all have a lovely Saturday morning. So how was your weekend? Isn’t it strange being back to normal after a three-day weekend? 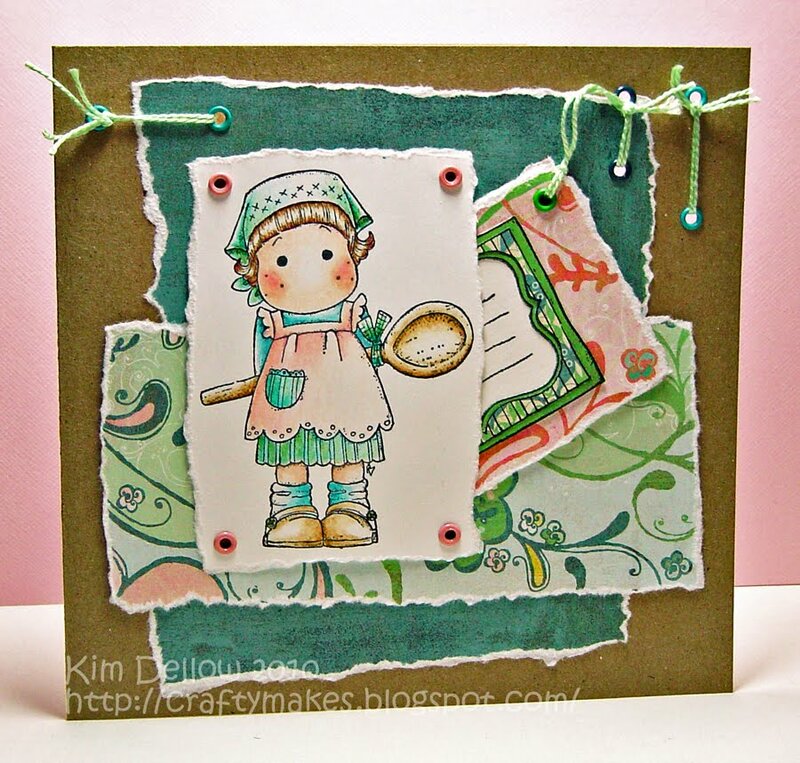 A challenge card for you today and this one is for the Simon Says Challenge. I’ve been meaning to do a challenge for these guys since the blog started but time never seems to be on my side. Anyway, I’ve managed to get this done for the wonderful sketch they have this week, but you need to hurry ‘coz today is the last day before a new challenge! 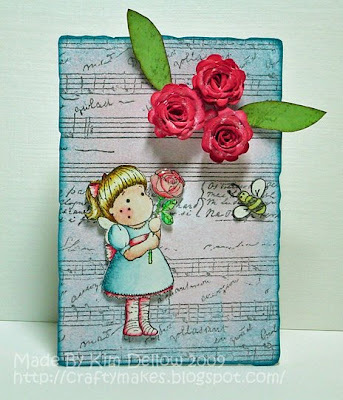 Details: I’ve inked up the rectangle stamp with Colorbox chalks, teal and coral pink and then over stamped with the fabulous music script stamp from Artistic Stamper (OK, I ‘fess up it was another new buy from the Olympia show). 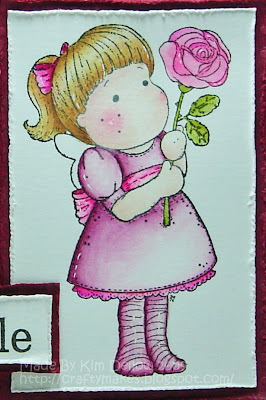 The roses were made using papers coloured with inks and following the fabulous tutorial from Nancy at Scraps and Inks. 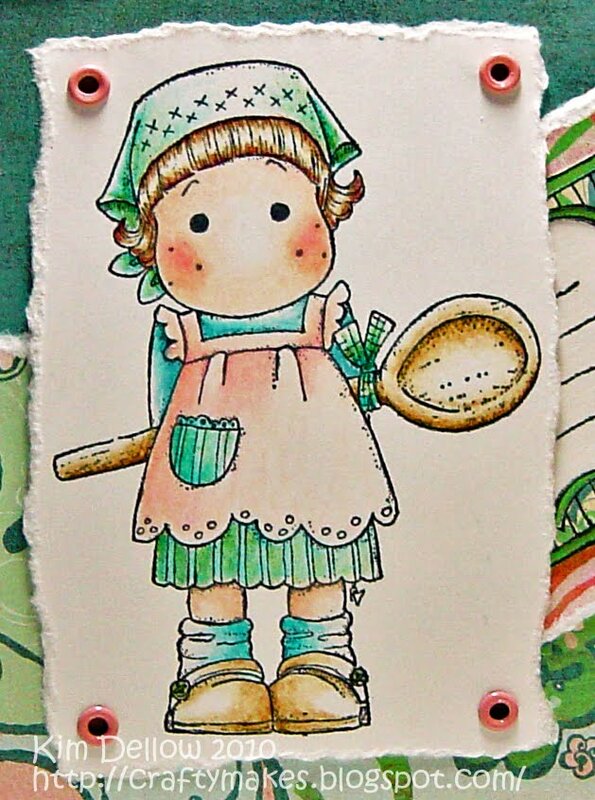 The image was coloured with a mix of Colorbox chalk inks and Koh-I-Noor watercolours. 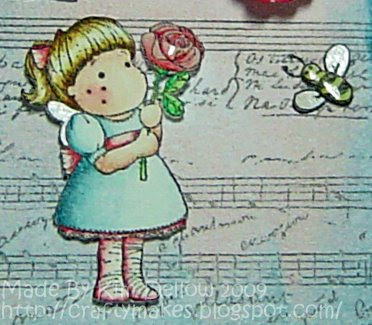 I used Shimmerz Angel Wings paint to highlight the wings and 3D-glue to accent the bee body and the little rose. How Busy Is Your Card? How busy is this card? I think I might have gone a bit mad with this one. I started to add glitter and just kept on going, by the time I had finished I was covered head to toe with the stuff. December is here and the countdown to Christmas has started good and proper now 🙂 Simple cards on a theme for you today 🙂 There are lots of glitter highlights here and there but they just never show up in the photo. 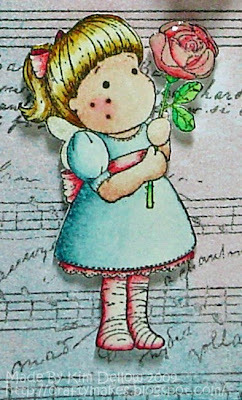 Here is one for this week’s Tilda and Co. challenge, which has a sketch for us all to have a go at. 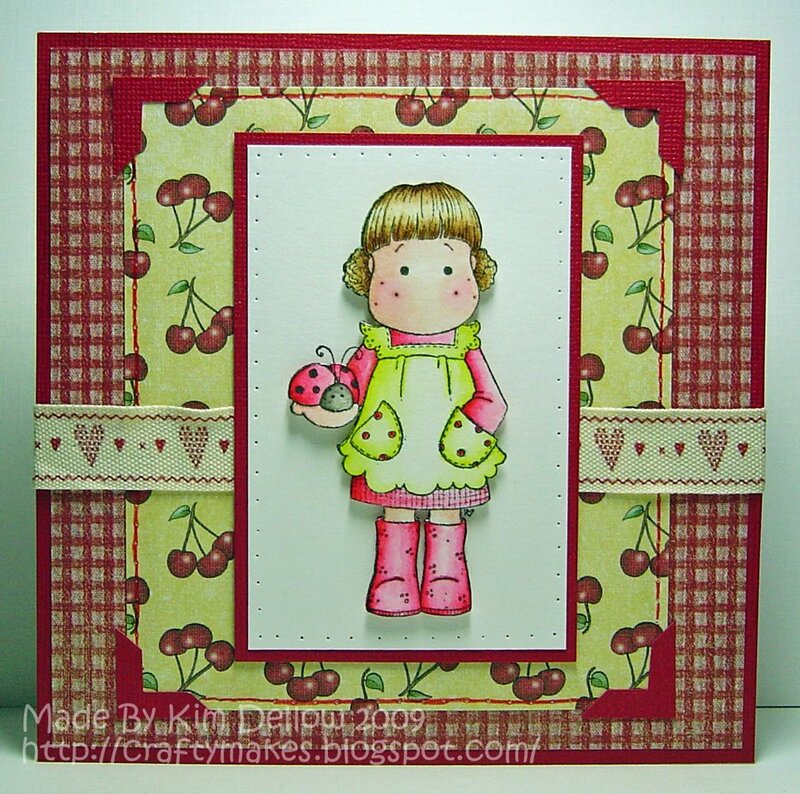 I’ve used a complete mix of papers here and the ribbon with buckle is from the Oh La La kit by Designs by Krista. I wanted some dimension and texture in this one so the underlying oval is scrunched up and inked. The Papermania exquisite paper has been glitter glued to highlight the flourishes and then attached to the background with double-sided tape in the centre rather than the edges so that they can lift away from the purple background. Each layer has been edged with ink and then silicon glued to lift it just a little. Ink – Versafine Black; Distress ink Walnut stain, tattered rose, tea.